How can you efficiently run a cross border e-commerce business? There will be a Business Cards Exchange Activities, so be ready with your cards. Aside from this amazing networking activity, it will be fun too. 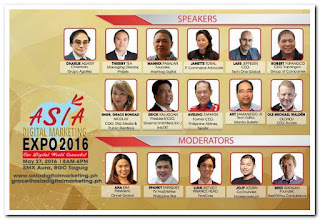 Adec Innovations, Air Asia Philippines, Alfox Printing Services, AMA Computer College, Apag Marangle, Artstream Hospitality Management Group Inc, Asian Institute of Management, ATR Kimeng Asset Management, Australian Embassy, Azalea Residences, BAhama Realty & Development Corporation, Blue Dynamics Inc, Bounty Fresh, Business Process Outsourcing International, CashCashPinoy, Cafelo, Café Lupe, Canadian Embassy, Carmudi, Chalre Associates, Cognizant, Commission On Election, Compos Mentis Inc, Creative Voices Production, Department of Science and Technology, DigiMoz, Digital Club Filipino, Elabram Systems Group, EmLogis, Embassy of Chile, ESCO Corp, Ensogo, FreelanceBlend, Forward Direct Selling Company, Fuego Hotels, Gardenia Bakers Philippines Inc, Geiser Maclang Marketing Communications, Globe GCash, Helix Technologies, Hotel La Corona De Lipa, Infinity Hub, Infotxt, International Tankers Corporation, Korean Chamber of Commerce, Laguna Science Polytechnic University, Lamudi, Makati Tourism , Mediacom, Megaworld, Melba’s Farm Bacolod, Misono Japanese Restaurant, MyDocNow, NGCP, NWSteel Tehnologies, One Lightning, OneA Events Place, Onnet Global, Orchid Cybertech, Paradigm Global, Payoneer, PhilAm Life Insurance, Philippine Software Industry Association, PMCM Events Management, Pudadak, RaiRaiken Restaurant Group, Santuario Divino Memorial Resort, San Miguel Corporation, Smart, Snipe, Subic Travelers Hotel, Summit Media, Sunlife of Canada, TAG Cash, TAG Fund, Tech One Global Phils, Inc., Toyota Motors Philippines, Tree Top Adventure Inc, Twitter, University of the Philippines, Victoria Court, Viber, VOffice, VRush, Xremo, Xyxon Pte. Ltd, Zalora, Zoomanity Group and more. Reserve your slot now. Limited seats are available as of today. 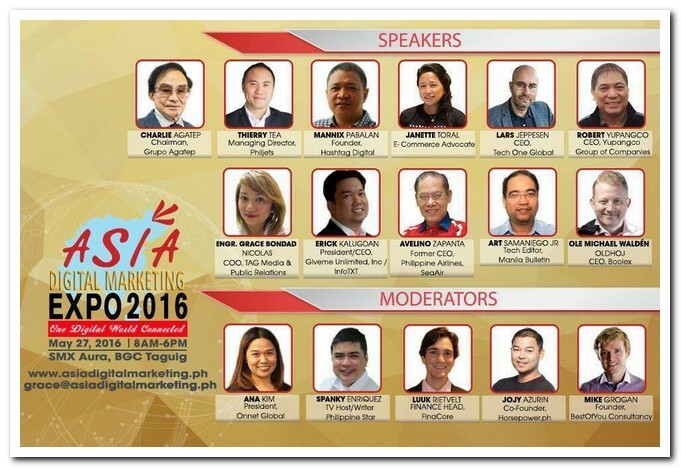 Registration fee is Php 4,000.00 with elegant lunch and snacks. Deposit your fee to TAG Media and Public Relations, BPI Account # 1680 0010 29.